I own a few books with titles like “100,001 Baby Names”. Totally unnecessary considering that I can look up anything online these days. 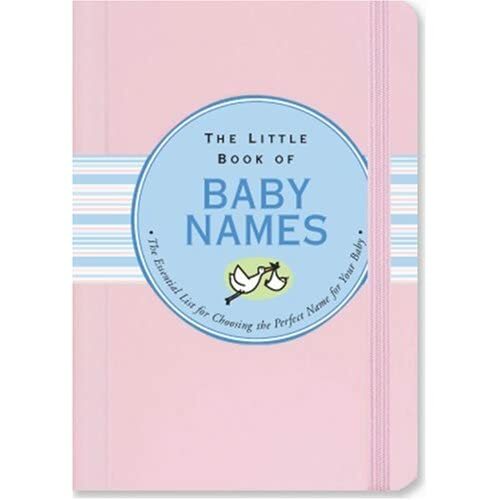 But I thought I would share my favorite “Little Book of Baby Names” that entertained me in the office (b/c it was small enough to hide in my purse) thanks to an old work colleague named Jenny! Now onto the gifts now that baby’s name has been announced! Something Personalized = Something Special. Here are a few fun, personalized ideas that will also personalize baby’s room! 1. Forget the little blue box – that was wedding. Red Envelopes‘ red box is just as nice for baby. This personalized snow globe makes an elegant, inexpensive keepsake for baby. 2. The stool is a must for the toddler years but buy one early from The Cubby Hole. Playing with a wooden puzzle while learning his or her name starts a lot sooner than later. 3. The personalized baby blanket is given but mom should also throw one over the rocking chair not only for display but to prevent the back of the chair from getting dirty. We really enjoy our wonderful initialed two tinas blanket and we think you will too! 4. The growth chart is just fun and there are so many sweet designs to choose from at Land of Nod. 5. You’ll be surprised how quickly you will carry a lunch box for your little one when eating out or at the park. These personalized Warm Biscuit boxes double as great display and storage for cards and crayons. 6. Back to the rocking chair: Mommy’s back will also enjoy a beautiful, contemporary custom pillow from Mimi and Lola.